Nicki Sbaffoni, born and raised in southwest Pennsylvania, has been writing and performing music for more than half her life. 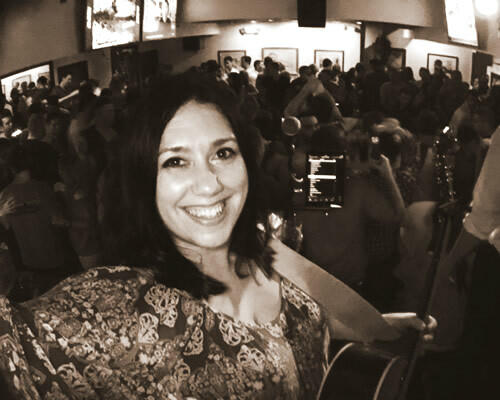 After moving to the Philadelphia area in 2002, Nicki found herself impressed by the wealth of opportunity in the local music scene and promptly gave up her day job for a new one: Acoustic Entertainer! As summers approach, you’ll find Nicki playing solo shows up and down the Jersey shore and year round performing all over the Philly, NJ, and NY areas. She is a genuine music fan, and unlike many other acoustic performers in the scene, can actually perform 100% requests. In fact, Nicki even provides laminated set lists including 380+ song selections to petition said requests. With a mantra of “strum and wail” Nicki consistently surprises and delights audiences with powerful versions of favorite songs as well as her eclectic song selection. While Nicki works consistently as a cover-based entertainer, she relishes in opportunities to focus on original music. Nicki’s compositions all fall snugly into the acoustic pop genre, with strong, emotional lyrics, hypnotic melodies, and catchy refrains.